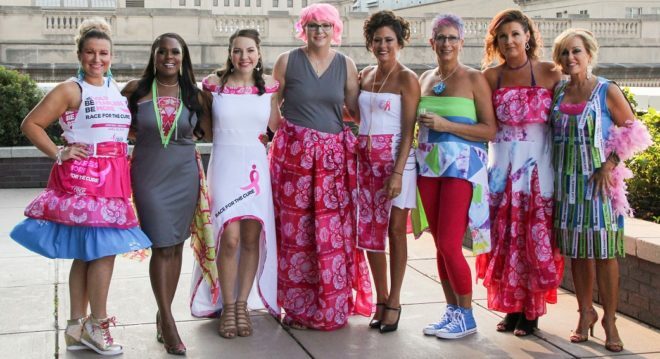 The 7th annual event, held on August 22nd, featured models who raised awareness about breast cancer and fundraised in support of Komen Central Indiana’s mission. The evening included one-of-a-kind outfits created from repurposed race materials by local designers. Congratulations to Tracy Miraglia for raising over $6,000 for breast cancer to win the 2018 Trendsetter Award. Congratulations to LaVondra Sanders, designer, who won for her dress as voted on by the judges. The event raised over $32,000 for Komen Central Indiana. See photos from the 2018 Project Pink Fashion Show. Meet this years Project Pink Models. Please contact us for information about sponsoring Project Pink.